Etlo is one guy. Yes, he's both. Also, she did not put the paper in there. She hates things that remind her of Zaul, and that paper was one of them. Somehow, Zaul knew that she was going to find it. He's hinting something about @Silverclaw_Bonnetfolly1. So but wait, Skylette has seen the paper before, but just never opened it??? She never saw that paper before. Just Zaul's handwriting. That was what scared her. The paper is new to her, so she has to figure out what it means. Thank you very much! AHH that makes sense! I just love the way you describe the characters feelings and thoughts though- there's a lot of deep stuff in there. Great job, keep it up!! I loved it!!! Keep up the good work! I noticed some of the connections to discussions to parts of the forum. 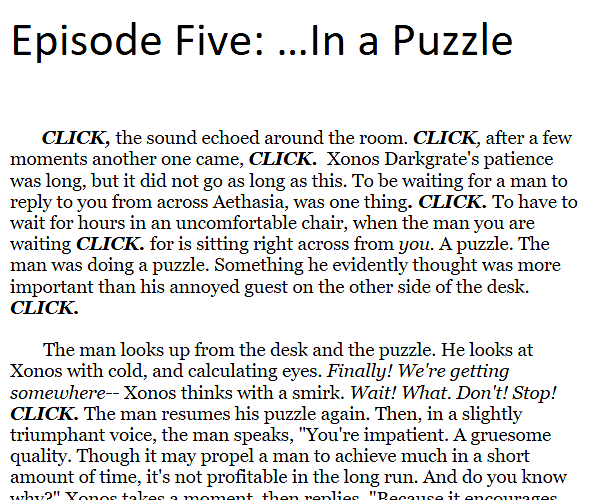 @Xonos_Darkgrate1, I think some parts in the story are a bit potrayed by your mood. Don't let that make your story different and ineffective.